Apples have been absolutely abundant in our house lately. The truth of the matter is that we accidentally doubled up on them when we made two separate grocery shopping trips last week. Yep, I grabbed a bag full of beautiful, organic Gala apples while I was at the store last Monday morning. (OMG they were so pretty!) Later the same day, Evan picked up a bag full of gorgeous, perfectly green Granny Smith apples as he made a quick stop by the market on his way home from work! So, what's a girl to do with all those apples?? Well, (obviously!!) my first thought was to make and bake an apple pie, but last week I was far too busy... okay and far too lazy to bake a pie. So, I decided to make a simple fruit dip...because my kids really LOVE fruit dip. Uh huh. Yep. There was really no more incredible logic behind it than that. We just needed some cinnamon-spiced fruit dip in our lives last week to pair up with all those perfect apples and I can tell you that we enjoyed the heck out of it! I'm a huge fan of the sweet/salty combo with lots of things, so I ate quite a bit of this creamy, sweet dip with some pretzel sticks too. I didn't plan it this way, but as it turns out this recipe is being posted just in time for the first day of October this weekend! 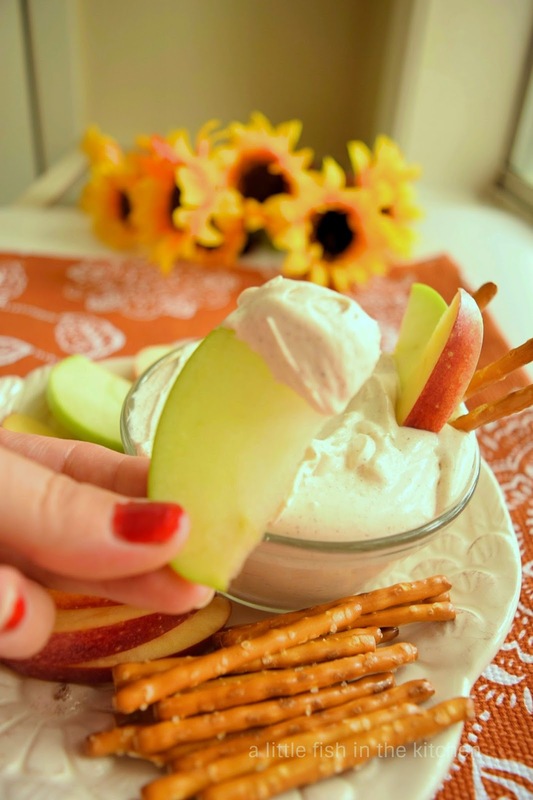 October is National Apple Month in the USA and maybe you'll add this spiced brown sugar apple dip to your list of ways to celebrate the beautiful fall apple harvest this year! Here's a tip to keep your freshly sliced apples from turning brown once they are cut: Place your sliced apples in a bowl and toss them with 1-2 teaspoons of lemon juice. Transfer the apple slices to a colander and rinse the lemon juice off. Pat apple slices dry with a paper towels and serve. The natural enzymes in most apples react when they are exposed to oxygen causing the apples to brown after they are cut. The natural antioxidants in the lemon juice reduce this enzymatic reaction and the sliced apple won't brown as quickly! This apple corer and slicer combo is on my "must have" gadget list. What is your favorite apple recipe? 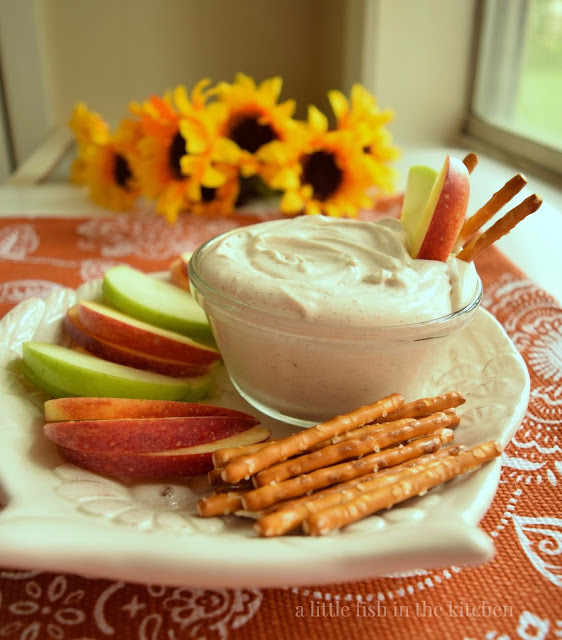 This is an quick, easy and tasty fruit dip to throw together for an after-school snack. It's a delicious treat for company too. Mix all ingredients for the dip together in a medium-size bowl, cover and allow to chill in the refrigerator for at least 30 minutes before serving. Transfer to a serving bowl and serve with fresh slices of sweet and tart apples, sliced pears or fresh pineapple chunks, as you prefer. I first thought the dip was made with apple :-) The dip looks very creamy and tempting! My fruit bowl is filled to the brim with apples. I hope to make an apple crisp tomorrow, but I'd love to dip a few cut up apples in your dreamy dip! Perfect for the fall- and how wonderful that your kids love apple slices! Favorite apple recipe? Mom's apple pie! Great idea Marcelle, what a great way to get the kids to eat more fruit. Grace, I have to admit to taking in a few apple-less spoonfuls myself :) thank you! What a delicious way to eat apples, Marcelle. The dip sounds delicious! If my kids were still around I know this would be a favorite after school snack! Maybe I will make it mine!